0.84 oz. 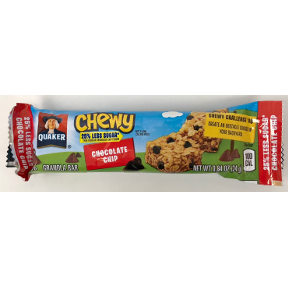 travel size granola bar in sealed package. 25% less sugar. Ingredients: GRANOLA (WHOLE GRAIN ROLLED OATS, BROWN SUGAR, BROWN RICE CRISP [WHOLE GRAIN BROWN RICE FLOUR, SUGAR, SALT] WHOLE GRAIN ROLLED WHEAT, SOYBEAN OIL, DRIED COCONUT, WHOLE WHEAT FLOUR, SODIUM BICARBONATE, SOY LECITHIN, NONFAT DRY MILK), CORN SYRUP, SEMISWEET CHOCOLATE CHIPS (SUGAR, CHOCOLATE LIQUOR, COCOA BUTTER, SOY LECITHIN, VANILLA EXTRACT), BROWN RICE CRISP (WHOLE GRAIN BROWN RICE FLOUR, SUGAR, SALT), SUNFLOWER OIL, CORN SYRUP SOLIDS, INULIN, POLYDEXTROSE, GLYCERIN. CONTAINS 2% OR LESS OF CALCIUM CARBONATE, INVERT SUGAR, SALT, DIACETYL TARTARIC ACID ESTER OF MONO-DIGLYCERIDES, MOLASSES, SUCRALOSE, NATURAL AND ARTIFICIAL FLAVOR, CARAMEL COLOR, SOYBEAN OIL, BHT (PRESERVATIVE), CITRIC ACID. CONTAINS COCONUT, MILK, SOY AND WHEAT INGREDIENTS. MAY CONTAIN TRACES OF PEANUT AND OTHER TREE NUTS.